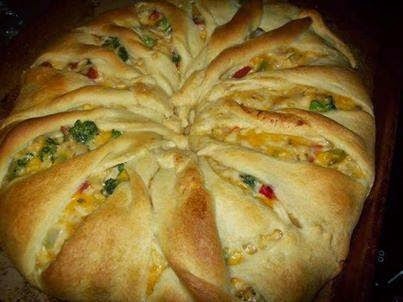 Unroll crescent rolls and arrange triangles in a circle on a cookie sheet with the wide part of the triangle being the center of the circle and the points going out. It will look like a sun. After you have arranged the rolls, I pushed mine with my hand a little in the center to create a larger area to scoop the filling onto. After I pushed the centers more, the circle in the middle ended up being about 2" or smaller. Scoop filling mixture onto the dough, in a circle. Fold points of triangle over filling into the center. (Filling will not be completely covered.) Pinch to seal. Bake 25-30 minutes or until golden brown. Let cool slightly before serving.